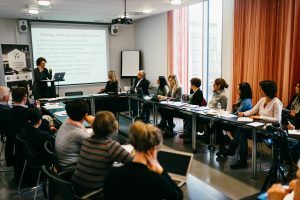 The project is coordinated by the Romanian organization, Association Pro Refugiu in partnership with Scandinavian Human Rights Lawyers Sweden, Caritas International Belgium, Association Trave Iniciativas para la Economia Social y Solidaria Spain, Center for the Study of Democracy Bulgaria. 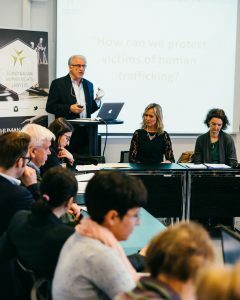 The project benefits from the support of several associate partners from Romania (National Institute for Magistracy, Bucharest Bar, National College of Social Workers), Sweden (Uppsala University Center for Research on Addiction U-FOLD and Hela Manniskan i Malmö Organization), Spain (General Prosecutor Office -Immigration Department), Bulgaria (National Legal Aid Bureau). 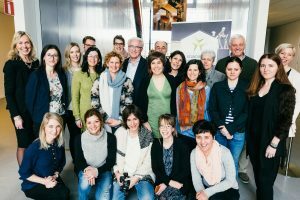 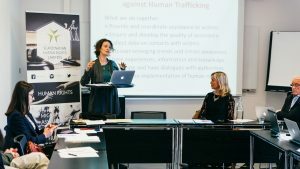 The event gathered professionals (lawyers, social workers, psychologists/psychotherapists, doctors, police officer, experts, researchers) with expertise on issues related to human trafficking and victims’ assistance. 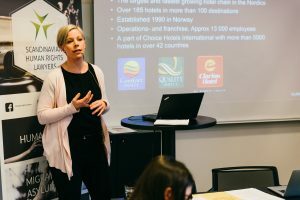 An event that allowed the Romanian, Swedish, Belgium, Spanish and Bulgarian specialists to exchange knowledge in areas in which they activate and also allow to learn more on the Swedish intervention methods to combat human trafficking and assist the victims (strategies to combat human trafficking and legal aid in Sweden; support and assistance to victims of human trafficking; how to cope with traumatized persons-rehabilitation and treatment; the correlation between drugs and human trafficking; anti-trafficking strategy from the hotel business in Sweden to combat human trafficking).